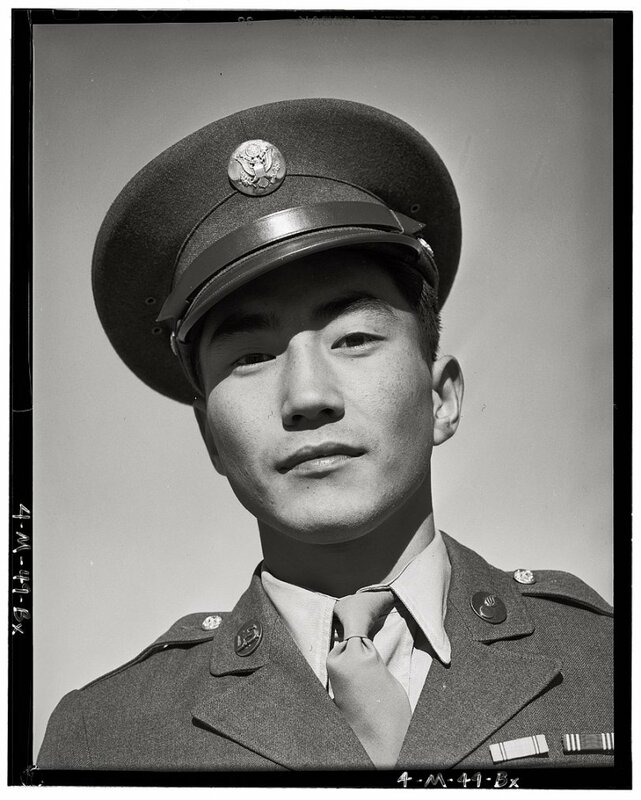 Corporal Jimmie Shohara, visiting his parents at the Manzanar Relocation Center in 1943. View full size. Photograph by Ansel Adams. Submitted by Anonymous Tipster on Thu, 01/21/2010 - 11:35am. Since I'm sure I'm not the only one who regularly goes through older postings to read comments, I thought I'd add this link about Ben Kuroki. I saw a PBS profile on him and his story is absolutely fascinating. I thought perhaps people looking at this photo might also be interested. p.s. There's quite a lot of google results for Jimmie as well. Submitted by Anonymous DC Tip... on Mon, 06/01/2009 - 9:50am. Seriously hot. Can we put him in a gallery of "Hot Guys" ? Submitted by J.A.G. on Tue, 01/01/2008 - 7:58pm. Hi I am a student and I participate in History Club at my school. Our topic is about the Japanese Internment Camps. I am in a group with three other students and we were hoping you could help us out and answer some questions? If you can, could you please answer the questions below and respond at the email address misscathy11@optonline.net. Thank you! 1. How did you feel about fighting in the war? 2. Did you have any family at the Internment Camp? 3. Did you like the food at the camp? 4. What made you want to risk your life and fight in world war II? 5. What did the camp look like? Submitted by Anonymous Tipster on Thu, 06/28/2007 - 10:33am. There was a Nisei or Japanese Infantry Regiment in the US Army...served in Europe and was one of the most decorated units in all of our armed services. The War Department segregated the Asians from the other units such as the Caucasian and the Black units. The Hispanics and American Indians were integrated into the caucasian units. Submitted by Anonymous Tipster on Thu, 06/28/2007 - 2:08am. Also I forgot to add before that Corporal Shohara is seriously hot. Submitted by Anonymous Tipster on Wed, 06/27/2007 - 8:46pm. God, let's think about that one. For starters, have all Middle Eastern people been rounded up and put in internment camps? It probably isn't a whole lot of fun to look Middle Eastern in America today. Maybe as often as every day, even, you hear an insult from some uneducated jackass. That's really not very nice, and you definitely shouldn't have to put up with it. But it doesn't even BEGIN to compare to all the hardships Asian people went through in America in WWII. Don't trivialize what they went through. Submitted by Anonymous Tipster on Wed, 06/27/2007 - 5:33pm. Are conditions much different today for people who look Arabic? Submitted by Kristy on Wed, 06/27/2007 - 12:19pm. ...when a Japanese-American serviceman recalled being turned out of a California barbershop for being a ___(insert horrible comments and insults here) and this was the shocking part to me...he was IN UNIFORM when it happened! Submitted by George F on Wed, 06/27/2007 - 11:49am. I wonder how he was treated by his fellow soldiers as well. I know there was a lot of hate & anger in the US for the sneak attack on Pearl Harbor. Do you think he's still alive today? I'll bet he would have some really great stories to tell about his service time. Submitted by vintage_girl81 on Wed, 06/27/2007 - 10:34am. I can't imagine what a slap in the face that must have felt like, you sign up to serve your country and your country lacks trust in its own people. Second the first comment, not fair at all. Submitted by Ron on Mon, 06/25/2007 - 5:03am. Do you think someone said "this looks kind of dumb, that a serviceman has to visit his parents here" My grandparents visited my uncle in Arizona before he went overseas and they were Italian and we were at war with Italy. That isnt fair.